The American Board of Medical Specialties (ABMS) is very careful to claim their version of "Board certification" is a "voluntary process," otherwise, this Chicago-based non-profit 501(c)(6) organization might be accused of anti-trust behavior. "ABMS Maintenance of Certification" and "ABMS MOC" were registered by the ABMS in the US Patent and Trademark Office August 21, 2007 after filing the terms February 23, 2007. MOC for ABMS has value. We also know Ms. Margaret O'Kane, founder and President of the non-profit "National Committee on Quality Assurance" and that created and owns the Healthcare Effectiveness Data and Information Set (HEDIS). HEDIS is a tool used by more than 90 percent of America's health plans to measure performance on "important dimensions of care and service." We also find that Ms. O'Kane was a "public member" of the Board of Directors of the ABMS and advertised the importance of the ABMS MOC program "to patients and the pubic" by video and implies the ABMS board's actions assures improved "outcomes" for patients. 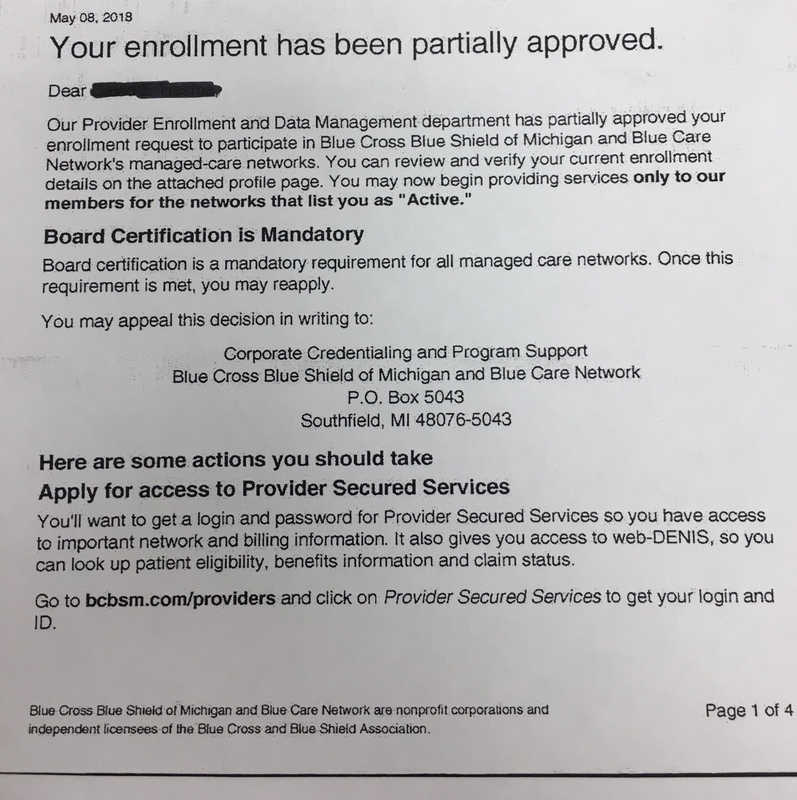 While claiming MOC as a requirement for physicians to receive payments because it assures their "quality," BCBS of Michigan does not demand the same of mid-level providers like physician assistants and nurse practitioners without similar subspecialty training. Additionally, physicians who received their "Board certification" before 1990 and are farthest away from their training are not required to perform ABMS Maintenance of Certification to remain on those same insurance panels, introducing a hypocritical and discriminatory double-standard that financially benefits insurers and hospital systems (more insurance claim denials and cheaper staffing requirements). ABMS is the puppet of the insurance companies, just as they were the puppets of Big Tobacco in the 60's. The IRS, FTC, and SEC need to get serious about investigating this ruse. It's compromising patient care and our patients' access to care. P.S. : If you haven't contributed already, please consider donating to the legal fund sponsored by Practicing Physicians of America that hopes to bring an end the ABMS Board certification/MOC monopoly nationwide.